Bowls filled with cocoa pops. A couple of biscuits. Strawberry milkshake that was pale pink towards the end of the bottle or almost fuchsia if someone wasn't paying attention. The constantly consumed toast of student days. When I was little we would have supper just before bed. It's a habit I fell out of but sometimes I find myself too hungry to go to sleep. 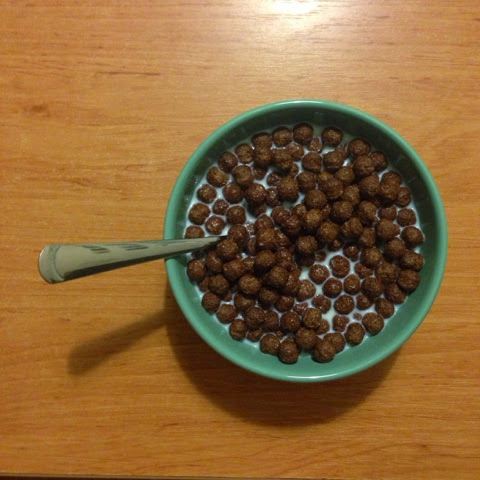 My go-to snack now is cereal and, yes, I definitely have chocolate cereal even in the week I turn 26. It's weird what things transport you to your childhood. Late night snacks definitely cause memories to flood back. My mum usually taught a couple of nights a week and I remember that my dad often kept a variety bag from Swizzels Matlow hidden somewhere. Lollies, parma violets, fizzers, boiled sweets. I definitely had preferences among the selection. My sister and I would spread the choices out all over the floor in our front room and carefully select our one or two for that night. As the weeks went on there were fewer fizzers and a higher proportion of cola flavoured, sherbet filled sweets. Just a simple little memory from my childhood, as I sit and eat a bowl of cereal before heading to bed. Did you have a pre-bedtime snack as a child?